Keitokuin Temple (景徳院) was built in 1582 by Tokugawa Ieyasu for the dedication of Takeda clan. 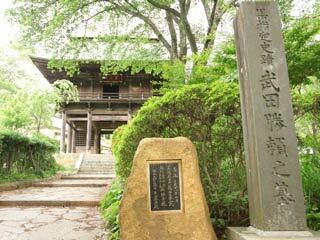 In the temple there are stones where Katuyori, the last lord of Takeda, and his family commit suicide. Keitokuin was located on the last spot of Takeda clan and his samurai. In 1582, when Tokugawa Ieyasu moved his army here, he asked Nenkyo, the brother of Komiyama Tomoharu, to built a temple for Katsuyori and his samurai.